Every once in a while I’m gifted with a painting idea “from the gods”. These gifts are rare and unexpected. They keep me on my toes, my energy high in anticipation, and my love for painting deep. That’s the way I feel about my current painting, “Weaving a Journey”. This painting began about ten years ago with my idea to show two hands weaving Hala leaves. Hala Trees are common in the Islands. The leaves are thin, long, and flowing. 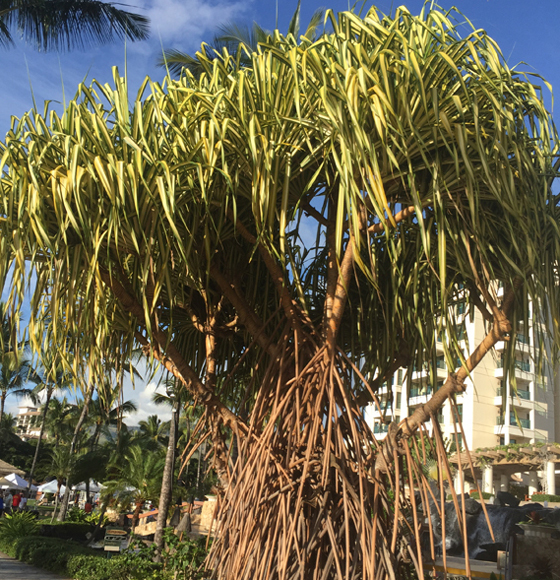 When the leaves are woven together, it’s called Lau Hala. Baskets, hats, mats, purses, and many other things are woven of Lau Hala. One of my painting mantras is to only paint what I know to paint. When I don’t know what to paint, the painting is put away. When the initial phase of this painting was finished I wasn’t sure how to complete the rest. I put it into my flat files waiting for inspiration to claim me again. Many artists start with a plan and do sketches before they start to paint. I’ve tried that method only to find all my inspiration and energy goes into the sketch, leaving my painting feeling flat. There are more ways to paint than there are people. It’s important to find your own way to paint and follow the path that works best for you! To keep my paintings fresh and alive, I jump into them as quickly as an idea hits me. By the time I felt ready to finish this painting, years had passed. I’m honored to paint a version of the story of the journey of the first Polynesians to come to the Hawaiian Islands. One theory is that the sails of the double-hulled canoes that brought the people here were woven of Lau Hala. These leaves are long with rough edges that will “eat your hands” until callouses form. To weave a large sail, a line of women sat close together. It’s important that the weave remains tight and even. When one woman would tire, another would take her place so the weaving could continue. I painted the double-hulled canoe. The people paddling it were next. I was very nervous about adding them, and until I did, the painting wouldn't be finished. Until a painting is finished, it’s just a piece of paper! Yesterday while painting at the kiosk at the Hilton Hawaiian Village, I asked one of the bellmen to help me understand the ergonomics of paddling a canoe. He explained the last person in the canoe steers it, so his paddle is upright. Every paddler keeps his face forward so he can see where he's going. Then, brush in hand, heart in my throat, I painted the paddlers, one at a time, taking breathing space between the first few until I felt comfortable to continue. I'll let the painting rest for the weekend before deciding whether or not it's finished. See for yourself and let me know what you think. All that angst for a few simple brushstrokes!